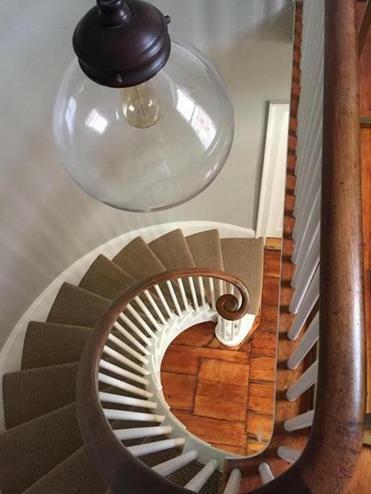 The original front stairs in the Sailmaker’s House. If you were going to pick the perfect pair to renovate, reopen and run an historic inn in downtown Portsmouth, N.H., it would be Amanda and Jay McSharry. They’re energetic, well-connected in the community (Jay owns six restaurants and a microbrewery in town, including Jumpin’ Jays Fish Cafe, Moxy, The Franklin, and Liar’s Bench Beer Co.), and passionate about living and working in Portsmouth. Better yet: they have smart, sophisticated design sense and obviously the know-how and funds to properly renovate an historic building. That means changing the things that need to be changed and leaving the rest intact, maintaining the integrity and soul of the property. The 10-room inn, housed in a circa 1800 Greek Revival home, opened in December. While researching the building’s history, the McSharrys discovered that it was once owned by John Holbrook, who operated a riverfront sail-making shop. Paying homage to this history, they named it The Sailmaker’s House. The refurbished inn, set on a quiet South End side street, has rare outdoor space. In warmer months, guests can sit in a spacious fenced-in yard among flowering perennials and fruit trees. Best of both worlds: it’s a quick stroll to the city’s waterfront, top attractions, and buzzing restaurants. Inside, rooms are filled with gleaming original wide board pine floors, soft-hued walls, glossy white woodwork, and lots of natural light. Local artwork and contemporary furnishings add punch. There are original details throughout, adding uniqueness and character: the winding front staircase, wood paneled doors, the slant-y and steep “morning staircase” leading to a narrow upstairs hallway. Room 3 has an original copper medallion on the ceiling; Room 4 on the second floor has a mirror made from a ship’s gear mold. The Queen Suite, located in a more recently built ell in the back of the house, is a nice splurge, featuring a separate sitting area with large windows overlooking the gardens. We like the updated touches, too: the renovated tile baths, the modern furniture, flat-screen TVs, in-room climate control (including air conditioning), complimentary Wi-Fi, and keyless access (you’ll get an entry code upon booking). It won’t take long for people to discover this little gem. 314 Court St., Portsmouth, N.H., 603-380-3447; www.thesailmakershouse.com. Room rates start at $104.